Trending at $78.31eBay determines this price through a machine learned model of the product's sale prices within the last 90 days. Trending at $78.76eBay determines this price through a machine learned model of the product's sale prices within the last 90 days. Apple iPhone 5S (AT&T). This is a pre-owned Apple iPhone 5S. The unit has been wiped and the iOS has been re-installed. (Tested and Full Functions, R2/Ready for Resale). Pictures are a representation of the units listed. Trending at $57.00eBay determines this price through a machine learned model of the product's sale prices within the last 90 days. 1 Apple iPhone 5s Smart Phone (AT&T Unlocked, Silver (White) ). This Smartphone is New other condition. 1 Apple Stereo 3.5mm ear piece. Manual & SIM Card NOT included! 1 Charging cable. Apple iPhone 5S (AT&T). Storage Capacity: 16Gb. Includes a used 2.5W adapter and lightning cable, no other phone accessories are included (Cover, SIM card, etc.). This is a pre-owned Apple iPhone 5C. Also compatible with prepaid GSM SIM Kits, including Cricket Wireless, Net10, H2O, GoPhone and Simple Wireless. Warning: iPhone is not unlocked! Capture images while you're out and about. IPhone 5s. Pretty sure it is for AT&T. ESN should be clean, but I have attached a pic of the IEMI if you want to check for yourself. Phone only. Apple iPhone 5se- 16GB - Pink (Unlocked) A1723(GSM). Condition is Used. Shipped with USPS First Class Package. Trending at $72.86eBay determines this price through a machine learned model of the product's sale prices within the last 90 days. This is a brand new, unused demo iPhone 5s in factory sealed packaging. The phone is Unlocked for use with GSM carriers only, it will not work with Sprint or Verizon. The phone will include the USB cable and wall adapter. No earbuds are included. What you see is what you get. Nothing more, nothing less. The SIM card has been removed. Space Gray iPhone 5S 16GB. This phone is alsoUnlocked for use with GSM carriers in the US. This phone has 16GB. Verizon may no longer support this phone. Fully tested by our in house technicians. Functionality : 100%. Trending at $94.46eBay determines this price through a machine learned model of the product's sale prices within the last 90 days. Apple iPhone 5S 16GB Space Gray AT&T - Fair Condition - Debris on Cam. 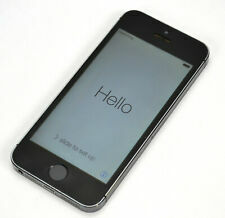 IPhone 5S 16GB - Space Gray. The screens will typically contain moderate to excessive scratching with a combination of many light and deep scratches and occasional white spots/LCD light bleed on the display. 4.5 out of 5 stars - Apple iPhone 5S 16GB Space Gray AT&T - Fair Condition - Debris on Cam. 438 product ratings438 product ratings - Apple iPhone 5S 16GB Space Gray AT&T - Fair Condition - Debris on Cam. Condition is Used. Phone is in great shape and has always been in a thick leather case. Almost no signs of wear. A Space Gray iPhone 5S 16GB. This phone is alsoUnlocked for use with GSM carriers in the US. Verizon may no longer support this phone. Once you receive the SIM card, call back or insert the SIM card for further instructions.